Ever since I can remember, my father has collected music. He has shelves upon shelves full of cassette tapes, 8 track tapes, CDs, DVDs, and of course, vinyl records. He’s the reason I often find myself drifting toward those stacks of lovely plastic treasure at the resale shops. It seems like I just can’t help myself! Sadly, though, there will always be some LPs that just don’t make the cut. Some are just so scratched, so warped, so beat up that that don’t play anymore. It’s probably time to let them finally have their well deserved rest, right? OR how about breathing new life into them with this amazing trend I’ve had come across my craft dashboard lately: vinyl record wall art! 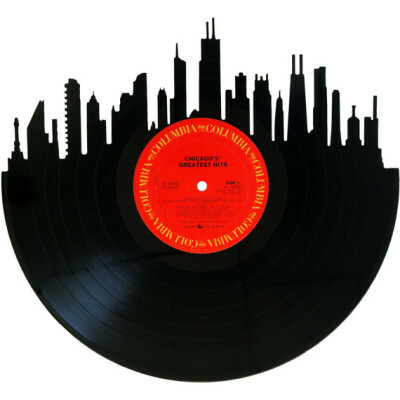 The Chicago skyline on Chicago’s greatest hits! 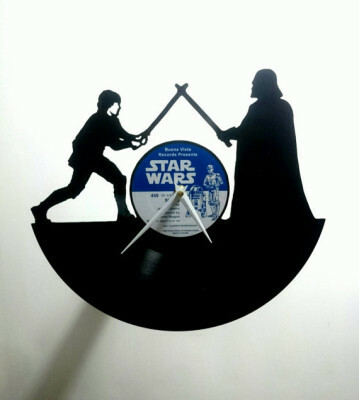 Some genius out there decided to upcycle some of their old vinyl and we get to reap the benefits! Whether you want to commemorate your favorite city (as pictured above) or immortalize your favorite album, there are plenty of options out there. 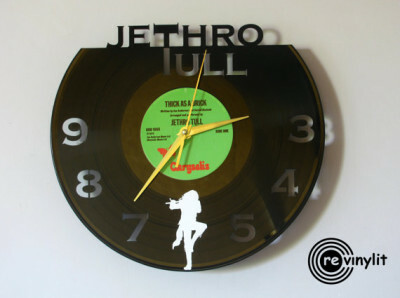 Now your poor copy of Thick as a Brick can live on…as a clock! They aren’t limited to just bands, either. 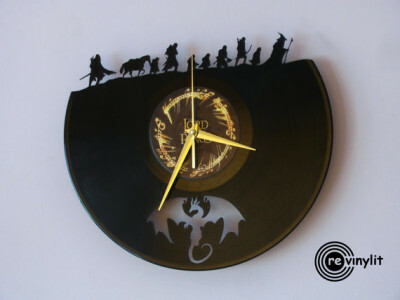 Think soundtracks or other fandoms and the possibilities are endless! I was very impressed with some of the fine quality art that a simple Etsy search turned up! If vintage is your type of thing, I highly recommend indulging in this super cool trend. 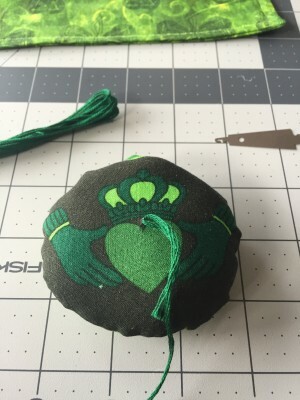 Last weekend I featured a Kickstarter from Craft Hacker member Dyrad Tea. Today I am going to do something a little different and tell you about an Indiegogo that I am doing for my business Quiltoni. Those that follow me on Social Media know that I had a large theft in October. I lost all of my quilts and pillowcases and insurance din’t cover anything. It was a very devastating blow and I didn’t know if I was going to continue on. After a lot of support from friends and fans I decided to pick myself up and move on. A lot of people suggested creating an account to collect donations. While I support other people that do this, I don’t feel right accepting money without giving something back. So for the last two months I have been working with friends on this Indiegogo Campaign that launched yesterday. (I know the audio is a bit fuzzy, it plays better on a phone than a computer). We came up with some really cool rewards (other than quilts, pillows, and dice bags) that I am excited about. This will be a special one time only quilt where I will include the names of every person that chooses this reward. After I finish the quilt, I will bring it to every convention I attend for an entire year. So what happens to this quilt after the year? It will randomly go to one of the people on the quilt! 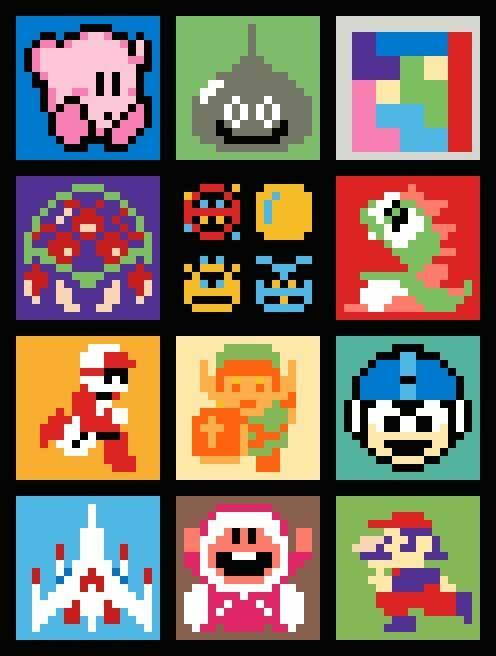 Making the NES Sampler Quilt and can’t wait 12 months to get all of the patterns? 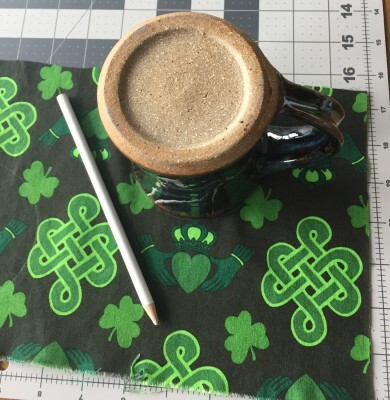 For $50 you will not only receive all of the patterns in a PDF format, but you will also get a special iron on label showing your support with your thank you note. This is my favorite reward. If you choose the Where is North America is Toni I will travel to you and spend at least 2 days doing something fun. I can give you private quilting lessons, teach classes, do charity work, or just hang out and play some cards. I really hope I get to go places I have never been! The Weekend Adventurer is the most requested reward. If you choose this reward I will give you the VIP experience from our point of view at a convention. Lodging, Food, and a pass to the convention will be provided. (Your travel is not covered). You can hang out with us the entire weekend and see what it’s like to be an artist. There are some conventions I am not able to get an extra pass to, so if you would like to check to see what convention options there are, just ask! Please take a look at my Indiegogo campaign. Even if you can’t make a pledge, sharing it supports me just as much! Time for the second block of the NES Sampler Quilt a Long, Tetris. 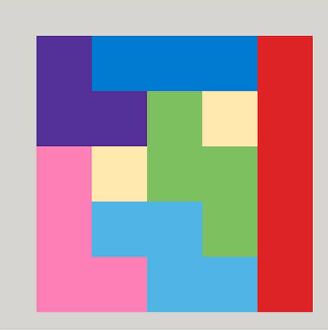 You can find the pattern to Tetris here in the forums. Also feel free to share your finished blocks in the forum you get the pattern from. We love to see how you make your blocks your own. FunkyMonkey has picked some really cool fabrics so far. 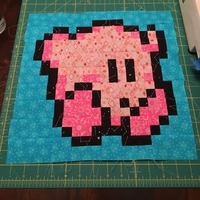 I can’t wait to see that finished quilt! 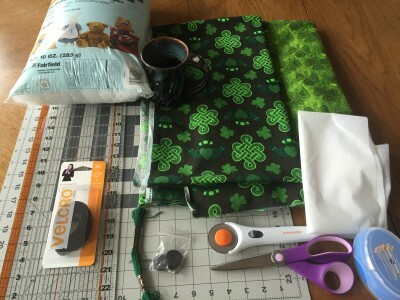 Since my last couple weeks’ posts were a little complicated, I decided to blog a DIY that is a little simpler and a little easier but by no means is any less cool. So if you are a wine drinker, or if you know a wine drinker – and I’ll bet a dollar that you do, then you’ll have run into the problem of the corks. Especially after a party, there’s corks lying around everywhere! I know that you have been searching for a solution to this problem since it began, but search no longer, for I bring you something awesome. First, you need to stop throwing out your corks. That’s right, I want you to put them in a bag and start saving them. You will need a frame, and you can either build a very simple one using wood from a hardware store, or you can find one in a second hand store or even buy one new. If you are building one from scratch, it doesn’t need to be fancy, though it can be thicker, which will change which way the corks are facing. I’m going to give you a tutorial for the easier version, with a bought/found/re purposed frame, that way, you can even feel great about recycling something. So you will need the frame, a glue gun and glue, a ruler and an exacto knife. As well as your corks. 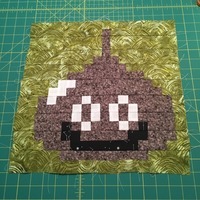 I’ve taken this tutorial and it’s pictures from Makezine, but you can find many around the internet. I found this one had the simplicity and the recycling factor that I was looking for, so I thought I would share this one. Your first step is to choose a frame and remove everything but the back board, which it is recommended that you glue into place so you don’t need to worry about it falling off. You will need to decide on a pattern to place your corks in. Simple and repetitive is the key. Take a look below. Before you actually start gluing your corks, if you find that they smell of wine still and that you can smell it pretty clearly, you can treat the corks by soaking them in a mixture of water and vinegar for a couple hours, but be sure to let them dry thoroughly before using them. Next is the fun part. You can start gluing down the corks onto the board in your pattern of choice. It’s recommended to start away from the edge as that will give you a more natural flow. Try to select shapes that work for your pattern. If you’d like to be more economical but messier, you can cut your corks in half to get more bang for your buck. When you have fit all the full corks into your frame that you can, this is where you will need to carefully cut the corks to fit to the edge of the frame. 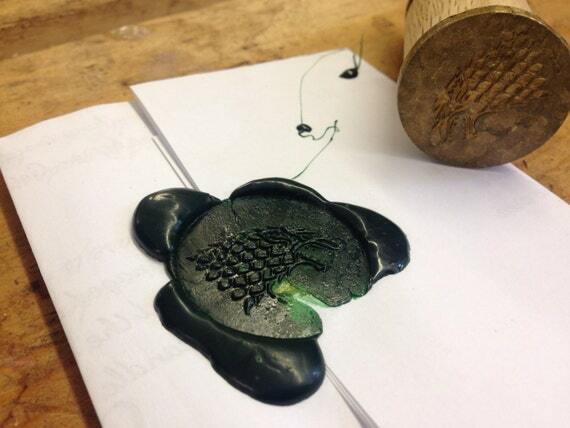 The neater they are, the nicer it will look so don’t rush and please try not to cut your fingers off. When you are finished you may have little globs that spilled out or that left a trail from your glue gun. Don’t worry. Just pull them off to clean it up. The corks should stay put. Your last step, though it isn’t necessary, will help seal and make the texture of the corks more noticeable. A few coats of a clear gloss will do the trick. And voila! You’re done. You can place this beauty in your own home or give it as a gift to someone you love very much, because you drank all that wine for this, of course. This is a subject I’ve been looking into a lot lately as I’m designing a planner book for my business and I thought I’d take today to share some of my findings for those who may also be curious about making their own books. 🙂 There are basically 3 main options depending on how invested you are and how much money you’re willing to spend, so let’s go most to least expensive. 1) Buy your own machine for coil binding. Easily the most expensive as machines that will punch holes in no more then 6 pages at a time start at $80, but if you are looking to make books to sell it’s a great investment. The one pictured above is one of the least expensive, but very highly rated and called the GBC Pro Click. The nice thing about this product line is you don’t have to manually wind the spiral into it. Simply buy the side binding, line them up with the holes and snap it closed. Done! The limiting factor is only what sizes the coil binding lengths come in. If you have the no how and the skill to design your own pages and print them, many office center places (Staples, Office Depot, FedEx/Kinkos) will coil bind your work for as little as $3. Costs for the cover/back are extra, and if you have a thick book (over 100 pages) it will be more expensive, but nothing over $10 unless you’re doing something incredibly fancy or hard. 3) Buy a hole puncher and wire like a true DIY! If you really want to make it all on your own for the ultimate customizing, I have got the tutorial video for you. It’s by youtuber Sea Lemon and she easily walks you through making your own spiral book. All you’ll need is paper, a ruler, an Xacto knife, wire (16 gauge for smaller books), and a hole puncher; specifically with 3mm hole sizes. I’m part of an artist group on Facebook that is all about helping people improve their work. Two days a week you are allowed to do self promotion and while I normally don’t actively scroll through the hundreds of postings to showcase here, one artist caught my eye this week. Cameron runs a shop called Cubic Fox Props in Canada where she primarily makes wood based items, such as the map I’ve added up above. The map is what caught my eye from her post as it’s just so well detailed and created. 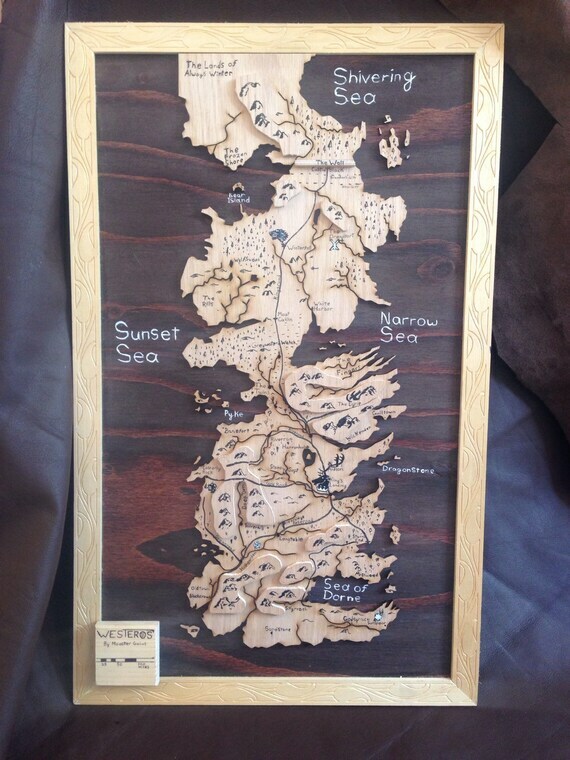 A laser cutter was used to carve the map out and then all the details are added in by hand. I can only imagine the hours of work that went into it as it measures over two feet tall! The east coast in the States is getting hit with a Blizzard this weekend. In honor of all the snow they are seeing (a lot of the areas aren’t used to the snow) I figured I would give you a few tutorials on how to make snow sculptures. You can’t just take snow and build something, there is actually a technique to it. Geni-us from Instructables has a tutorial on how to make a sculpture with words. The Fun Times Guide has a lot of great advice for making snow sculptures. I didn’t realize to make it last you need to spray it with a garden hose to freeze it. Finally, if you want to add some color to your sculptures you just mix food coloring with water in a spray bottle. Who knew it was that easy?! 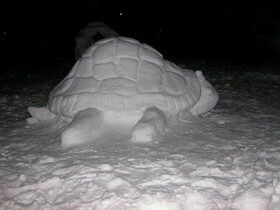 Share your snow sculptures in our forums. We want to see them and may share them here! I was talking with a friend this morning and I realized that she didn’t have a furnace in her house. She used a lot of other means of heating the place, and I was thinking about something like this as we were speaking. So, I know that there is a Craft Hackers post on making DIY hand warmers. And this is going to be kind of similar except that it is a bed warmer/cooler. What I really like about this project is how useful it is both in the winter, when things get chilly, but also in the summer to keep us folk who don’t have air conditioning cool. The downside is that you do need to be aware of the safety precautions so that you don’t get burned (when it’s hot) and also with regards to how to heat these things. But those will be covered, don’t you worry. I have used photos and directions from Making Our Sustainable Life, and though they’re a little difficult to describe in text, I’m going to try. This is one of those things where there are several different ways to do it and several different ingredients that you could use. The most important thing is the fabric you choose. You need to have something that works well with heat and won’t get too hot. Flannelette is great, especially for warmers, but any cotton will work also. In my opinion, cotton would work better for a bed cooler since it is a little thinner, but they will both work. Keep your eye open in the remnants bin for fabrics of a decent size you can get on the super cheap. 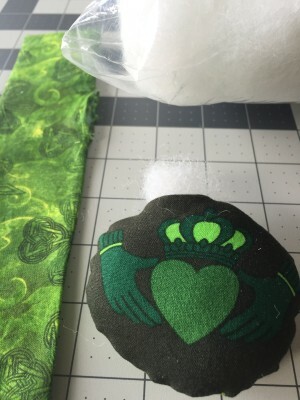 Keep in mind that you can make these any size you like, though I’m going to show you a tutorial that will help you to make one that is sized for a bed rather than just to warm your feet or to hold like a water bottle. 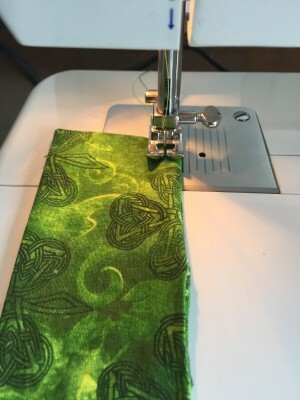 You will want to start with about 2 metres (or yards) of your fabric of choice. I always recommend washing and drying your fabric before using it, as you will lose some length to shrinkage. The second thing that you should do is check to see if all this fabric will fit into your microwave. Remember, it will be filled, so you don’t want to make it so big that it will not be able to fit inside. If you’re finding it is a little too much, trim it down in whichever direction you’d like to get it to an appropriate size. 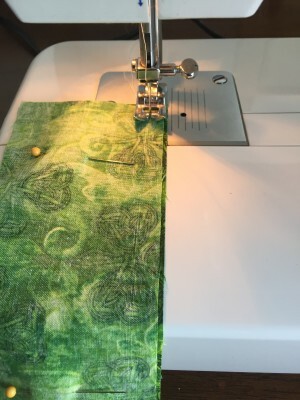 The last step, which will make this process a whole lot easier is to iron your fabric before you work with it – though you can feel free to iron it folded in half rather than ironing the whole sheet. 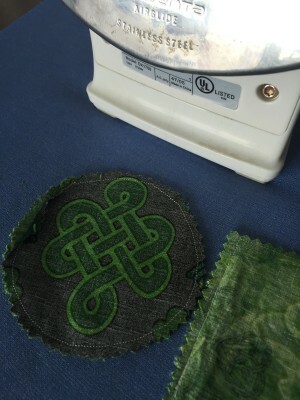 This is what your corner should look like once it’s sewn and folded. So, you will start by folding your fabric lengthwise (on the long edge) so that the right sides are together. 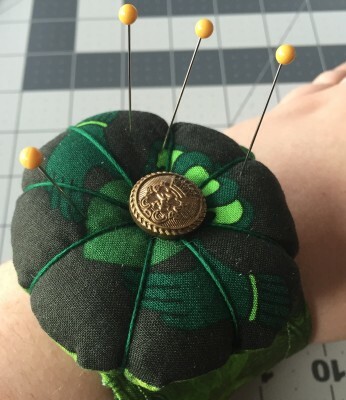 Next you will need to sew the two short seams on each end, leaving one long edge open. Once this is done, trim off any excess fabric, turn right side out and pop the corners so they look nice and square. I recommend you iron your seams down. They should look similar to that photo above. The first seam, splitting your pad in two. You can use any stitch type you like. Now, you will be making the pockets for your filling. 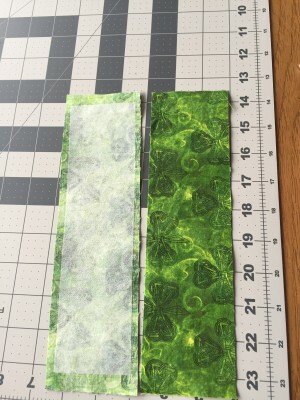 You can make as many or as little as you would like, though I wouldn’t go less than 2 inches wide, otherwise your filling will be difficult to put in and it won’t have a lot of space to move around. If you are using a larger filling like beans or corn, then they should be no smaller than 3 inches. 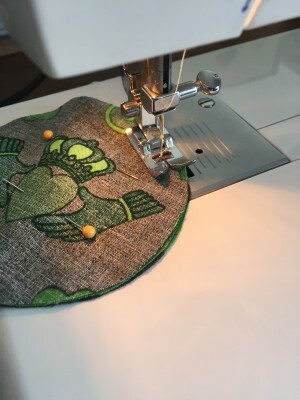 To do this, you can sew a seam across the middle of the fabric (sewing from the middle of one long edge to the middle of the other). 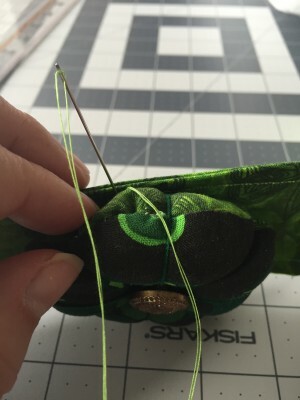 That smaller section you can split in half by sewing another seam so that you have 3 seams dividing your fabric into four parts (see photo below). 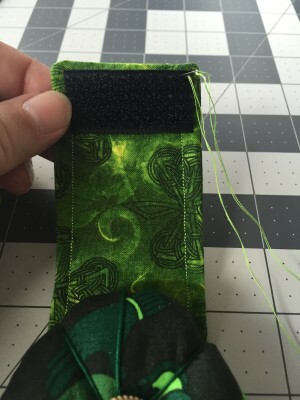 From here, you can continue the process of dividing the pockets with a seam until you reach your desired width. 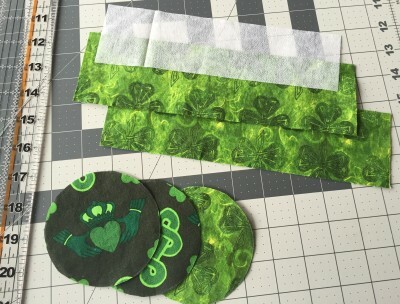 These are your first 3 seams that evenly divide your pad. Next, you need to decide how many pockets you’d like. Once you have all of your pockets sewn, you have the option to nicely finish that folded long edge. This isn’t necessary but it will make the end product look a lot more finished, it will match the other side and it will be much stronger. 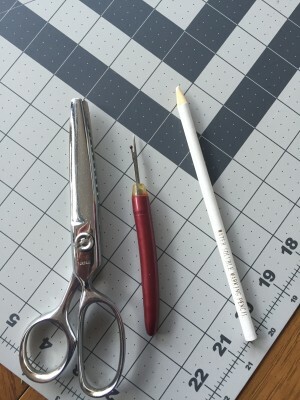 To do this, all you need to do is fold over the edge by about ½ an inch and stich it down. You can do a double fold if you would like, instead of a single fold. (see below for an example of what this sort of hem should look like. Now, add your filling! There’s a variety of fillings you can use. Rice, beans or corn (not the popping kind or you’ll be in for a rude awakening when you microwave it the first time). This tutorial I’m using for reference had 30 pockets of about 2.5 inches in width and used 1/3 of a cup of rice in each. This may not sound like a lot, but you do not want each pocket to be stuffed. If your pockets are of a different size, I would recommend not filling them up past half way, as this will provide enough space for them to move without making your warmer too bumpy. If you’re wondering how to get the rice inside… you can use a funnel or make one using paper rolled up into a cone. If you don’t have a funnel… improvise! After you’ve filled your pockets with all that rice, you will need to finish the open side in the same way you finished the other side. 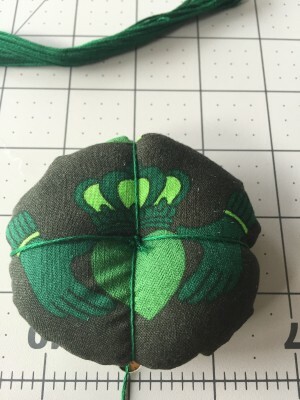 Fold the edge over (twice, if that’s what you did on the other side), pin, and sew. You’ll be moving a lot of fabric and rice around, so beware! The pockets should only be about half full. Though that doesn’t mean that I am. There’s a few other things to note. One is that you can add things to the rice as you fill the pockets. You can add loose earl grey – or whatever nice smelling tea is your favorite- or lavender. These will scent your bed when the pad is heated. Remember, safety first! So when you heat your pad in the microwave, heat it in 30 second intervals, with the turntable turned off or taken out. You can place a shot glass of water in the microwave with your pad so it doesn’t get so dry and hot that things combust. There will also be a slight smell of whatever you used to stuff your warmer the first couple of times you use it. Don’t worry though, that rice smell will go away after the first few times you use it. If you’re going to put your bed warmer in the freezer, put it in a plastic bag so it doesn’t absorb any odors from food, and so it doesn’t stick to anything in there. Lastly, please don’t sleep under or directly on top of the bed warmer. Like an electric blanket, it can still burn you. So please use caution. Either remove the warmer before you go to sleep or have something between the pad and your skin. I know this post is a little long, but for those of you who have terrible heating or who don’t have air conditioning, this will be a lifesaver.